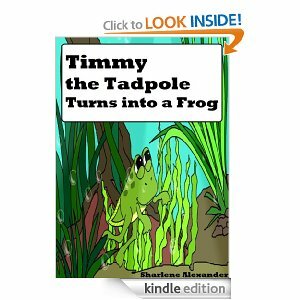 Book Description: Follow Timmy on an exciting adventure as he grows from a tadpole to a frog. Timmy is faced with many surprises throughout the story, but then…Well you’ll just have to read it to find out what happens. The gorgeous colorful pictures and fun rhyming story is sure to captivate any child’s imagination and bring them back to read it over and over again. Mary’s Review: A very colorful book that tells the tale of Timmy the Tadpole and how he grows from an egg to a frog. Watch as he grows from a tadpole eith only a tail and belly to a full grown frog with four hopping legs. It is told in a cute rhyming manner and the illustrations are adorable. I recommend this book for children ages 4-8. About The Author: Sharlene Alexander is a published author. Published credits of Sharlene Alexander include The Dog Dance (A Fun Interactive Children’s Picture Book Story), 10 Fun Beginning Reader Books:Helps Children Practice Reading (Learning to Read Series-Level 1), and Ahhh Ahhh Choooooo! : A Silly Sneezing Adventure (Perfect for Bedtime & Young Readers) (+INCLUDES FREE GAMES & Fun Sneezing Facts). If your child loves books by Mo Willems, Laura Numeroff, Dr. Seuss, P.D. Eastman, and Sandra Boynton, your child will fall in love with this children’s story. Follow Pax on an exciting journey to visit many silly animals and places. Children can’t wait to turn the page to find out where Pax will go to next. Start this adventure and find a great surprise at the end! This picture book is perfect for children in preschool, as well as early elementary school children who are learning to read. The adorable and funny story encourages reading, drawing, and critical thinking skills. -Interactive story that will get children saying, Ahhh ahhh choooooo! Mary’s Review: Pax is an adorable panda bear with a sneezing problem. Every time he sneezes-Ahhh, Ahhh, choooooo! His sneeze blows him into a strange and wondrous place. A desert with cactus made of chocolate, a jungle filled with purple monkeys. He never knows where he will end up. Then he has one humongous sneeze. Where does it send him? You will have to read the book and see. The illustrations are adorable and book includes fun sneezing facts. I recommend this book for ages 4-8. 2.99 Children’s Ebook Review -Can You Find It? Book Description: Children will have lots of fun trying to find the hidden objects in each game. Lots of games with over 150+ things to find! Also includes find the differences games. This is the perfect book to entertain your child on a car trip, waiting at a doctor’s office, etc. Mary’s Review: This is a fun filled interactive book for children that not only helps them find fun objects from letters, numbers, animals, and fruit, but will also introduce them to colors, teach them how to count and to identify many different objects. The book also includes the answer pages as well. The illustrations are bright, colorful and fun. I would recommend this book for ages 4-6.